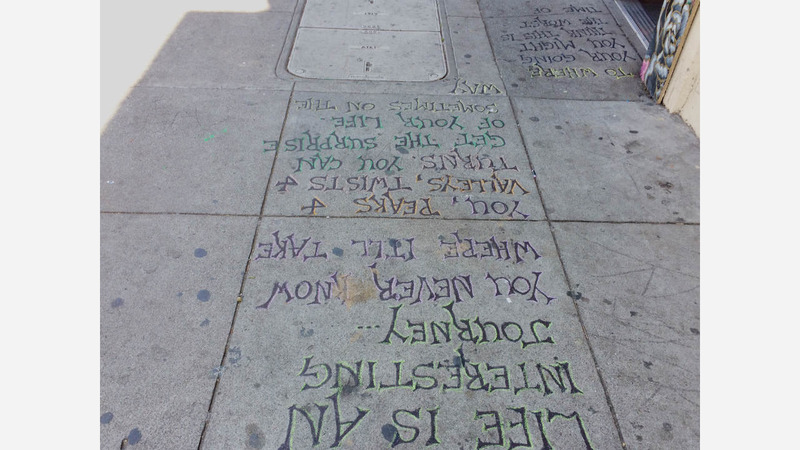 In the last few months, sidewalks around the Upper Haight have been used as a public chapbook by a writer who's left behind numerous poems and musings, but not everyone's a fan. Marked out with paint and marker in multi-color block letters, these installations by a woman who goes by Hightower have caught the eye of many visitors and passersby -- along with area merchants who are liable for sidewalk graffiti adjacent to their businesses. If Public Works issues a property owner a citation, they have 30 days to remove the graffito; after that point, the city sends its own cleaner and issues a $300 citation. To date, multiple Upper Haight merchants say they've been cited by Public Works because Hightower left her work outside. "All in all, not a fun thing to deal with," said Denny Garbuio of Fluevog Shoes. "The sentiment is great -- poetry on the streets -- but not at the expense of the businesses." Garbuio, who's received a graffiti citation, said the artist "was really apologetic" afer "we finally caught her in the act," but two more installations appeared nearby soon afterwards.